Ahmedabad-based Arrow Digital, a company offering digital printing/cutting services across India announced that it has installed Massivit 1500, the largest, fastest and most advanced large format 3D printing solution from Massivit 3D to offer a range of services such as creative 3D displays for advertising, retail and entertainment application. 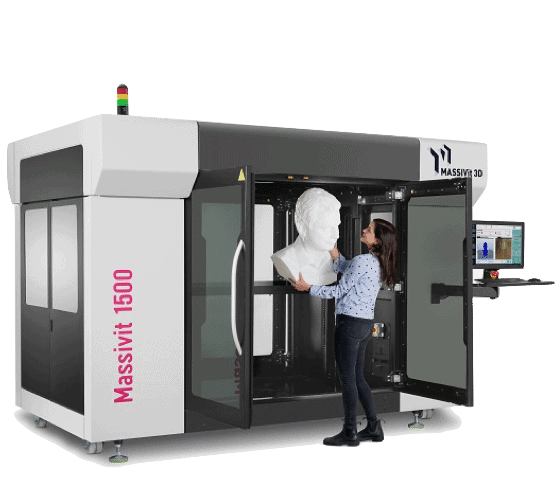 The Massivit 1500 is a super-fast large format 3D printer that works on Massivit’s proprietary GDP (Gel Dispensing Printing) technology that enables instant solidification and high-speed printing. The 3D printer is ideal for high-level marketing, advertising and themed projects. With output speeds incomparable to anything else in the 3D printing industry, the Massivit 1500 printer can produce high quality 3D pieces up to 54” high. The Massivit 1500 printer also utilises techniques that allow it to print non-vertical walls and ceilings, without the need to produce a solid object or intensive support structure. So in printing less to achieve the same result, the Massivit 1500 is able to dramatically increase print speed, while also reducing material costs and product weight – crucial for additional materials handling, transportation and storage benefits. In addition to Massivit 1500 printer, Arrow Digital also offers services on Massivit 1800, which can produce high quality 3D piece up to 70”. As a result, print providers seeking to dramatically extend their product portfolio beyond 2D printing can now have access to a profitable new and unique application capability, and an important business differentiator to enhance their competitive edge. Speaking about how the installation of new 3D printer will help the company provide more value to its customers, Sam Patel, Director at Arrow Digital said, “The Massivit 3D printed elements will turn any booth, event or show lively and will do pops up, engage and entertain viewers. It can be used to create complex forms, and hollow and internally illuminated objects”. “The 3D printer will also allow us to make accurate copies while still enabling variations and much more. Our customers can even use 3D printed objects as master for mould-making for thermo forming or for use as a mould. Massivit is truly an ultimate solution for all our customers’ 3D needs” concluded Mr. Patel.